We had another great meetup yesterday. Topics that I can remember going by- how to get artwork to markets, holiday shows and application deadlines, edgy shows vs traditional shows, Facebook vs Twitter, thinking about licensing, 1000 Markets, all the good things that are happening at Etsy, where to get business and stickers printed and what it costs… if this is what you are interested in and everyone around you is either clueless or bored by it all, our meetup is the place for you! Some of them are available and will go into my Etsy shop, probably this weekend. Another very hard to photograph girl- I’m going to have to learn more about under and overexposure on my camera. She has a dark purple body and a black cashmere pinafore. The pinafore has an embroidered sash. The camera wants to blend it all together. I did my best to show the colors and detail. The sweater had moth holes and I decided to use them instead of avoid them in the pinafore. She has a skirt made from my favorite angora/wool blend. It is so soft and yet has body that makes it hold it’s shape. Cashmere can be floppy and stretchy. Yes, and talking of stretchy cashmere, yesterday I thought I was all finished here but… after I went to bed last night, I was thinking about her pinafore and decided it need to be lined. It was too “relaxed”- Â not staying in shape the way I’d like. Today, I added a wool felt lining to the bodice and sewed it on with buttonhole stitch all the way around the edge. It is one of those things that doesn’t really show and only I care. But it felt so satisfying when it was finished and everything seemed to fit so much better. 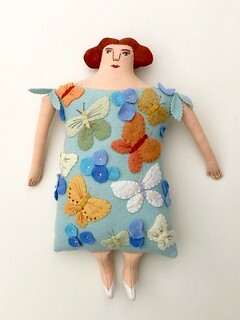 I will be putting the fish, the Moonbeam girls and this one on Etsy, probably tomorrow afternoon. I have put away any more girls for now- they are just giving me too much trouble! 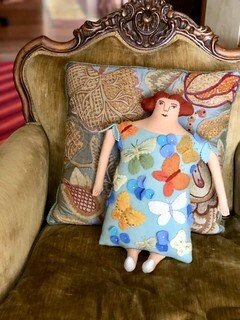 I am working on lady pillows and babies- sewing them up and then I will do the decorative work. I am hoping that I’ll be doing some traveling in the next few months and it would be nice to have some dolls all ready to take along and do the handwork on. Yesterday was the April crafty meet-up. There were 9 of us there- the biggest group yet! It was loads of fun. Look what Sharon made for Crystal! Â Next meet-up- May 12.